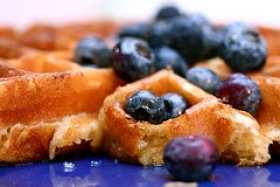 Have you made Almost-as-good-as-buttermilk Waffles? 2. Whisk dry ingredients together in a medium bowl. 3. Whisk yolk with milk and butter. 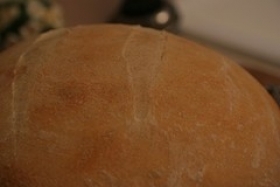 Beat egg white until it just holds a 2-inch peak. 4. Add liquid ingredients to dry ingredients in a thin steady stream while gently mixing with a rubber spatula; be careful not to add liquid faster than you can incorporate it. 5. Toward end of mixing, use a folding motion to incorporate ingredients; gently fold egg white into batter. 6. 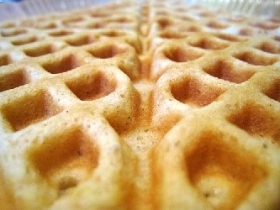 Spread appropriate amount of batter onto waffle iron. 7. 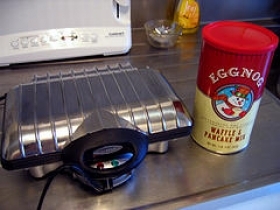 Following manufacturer\'s instructions, cook waffle until golden brown, 2 to 5 minutes. 8. Serve immediately. 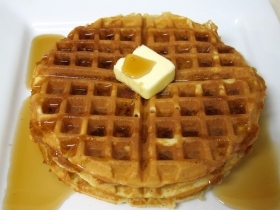 (You can keep waffles warm on a wire rack in a 200-degree oven for up to 5 minutes). 9. Makes 3 to 4 waffles. NOTES : \"If you\'re out of buttermilk, try this sweet-milk variation. 10. By making your own baking powder using baking soda and cream of tartar and by cutting back on the quantity of milk, you can make a thick, quite respectable batter. 11. 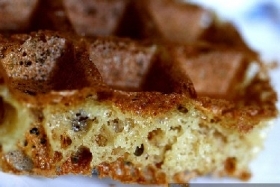 The result is a waffle with a crisp crust and a moist interior. This recipe contains potential food allergens and will effect people with Wheat, Egg, Milk, Butter, Gluten, Corn allergies.